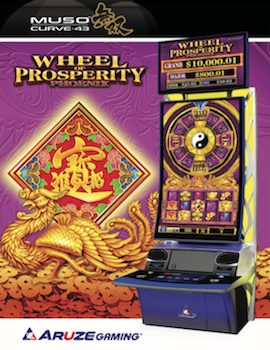 New from Aruze Gaming are the Wheel of Prosperity Dragon and Wheel of Prosperity Phoenix games. Both are five-reel, 243 ways games available on the new Muso Curve-43 cabinet. Three wild symbols trigger a wheel spin during the base game. The wheel will award either Free Games or up to 18x for the triggering spin. Wilds also signal a jackpot chance. If triggered during this chance, the wheel above the reels will become an all-jackpot wheel, which will spin once and award a jackpot. Wheel of Prosperity Dragon and Wheel of Prosperity Phoenix each have a unique Free Games series. Wheel of Prosperity Dragon awards eight free games. Any win with a wild symbol will trigger a wheel spin, awarding up to a 38x multiplier. Wheel of Prosperity Phoenix has a Free Games wheel that can award up to 25 free games on the initial spin, and is spun again any time three wild symbols appear during Free Games.